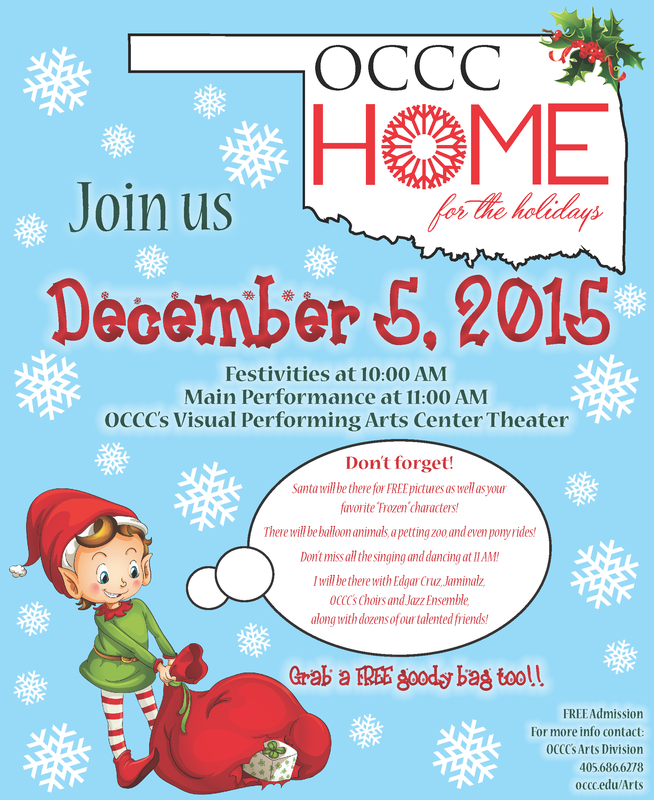 A petting zoo, pony rides, Frozen characters and Santa himself will be included in OCCC’s Home for the Holidays event at 10 a.m. Saturday, Dec. 5 in the Visual and Performing Arts Center. Arts Division Secretary Jessie DeArman said the free event is designed to bring the community together to celebrate the holidays. At 11 a.m., attendees can enjoy a show featuring local dancers, singers and a guitarist. DeArman, who is a tap and jazz dance instructor at the Dance Department in Midwest City, said three dances will be part of the event. One of those will be Perpetual Motion, a modern aerial dance studio. “They have a metal apparatus they hang from in the air,” she said. A dance trio choreographed by Lyric Theatre’s Sheridan McMichael and dancers from the Dance Department also will perform, DeArman said. The Janimalz, a local rock band for children, and OCCC’s Chamber Singers will also be a part of the festivities, DeArman said. Student Life Coordinator Travis Ruddle said children can get a free picture with Santa and receive a free goody bag. Music Professor Ron Staton said OCCC’s Chamber Singers will sing two songs in the event. Admission is free. For more information, contact the Arts Division at 405-682-6278 or visit occc.edu/arts.